Believe it or not, I wasn’t excited about Amiibo when I heard they were coming out. The idea of a figure unlocking DLC made me a little hesitant because I’ve never bought a lot of DLC. There were two experiences that got me interested in Amiibos. The first was seeing them in person at a local Best Buy. There was something undeniably cool about seeing a figure of a character I had only seen on a screen before. A couple days later, I heard that some Amiibo were already rare and that really got my attention. I have enjoyed collecting things all of my life and there is something about rarity and understanding what something is worth that is appealing to me. I decided on Thanksgiving that I would try and hunt down some rare Amiibo on Black Friday. I’m lucky enough to live in an area where there is a Best Buy, Toys R Us, Target, and multiple GameStops within 10-15 minutes of my house and I started hitting them all. I started at Game Stops and was disappointed by how few Amiibos they had and the ones in stock were all the common ones like Link and Samus. As I exhausted my list of potential places that might have rare Amiibos, I ended up going to Meijer (a grocery store chain) and was shocked to see they had one Marth and Wii Fit Trainer! It was a rush finding and having the opportunity to buy two of the rarest Amiibos. When I got home, I checked Best Buy’s site and was able to get Villager sent to my local store. By the time I got what was known as the “The Holy Trinity” of Amiibos, I was hooked and decided to get the whole set of Smash Bros. Amiibo. 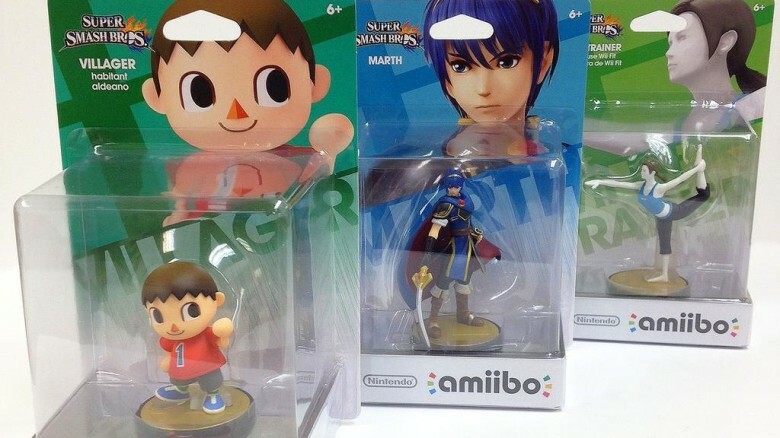 The Amiibos that drive many Amiibo collectors mad. I was very, very lucky to get them early on before Amiibos turned into the craze that it is now. Little did I know, I was ahead of the curve on Amiibos and that future waves would only be harder to pick up in-store. I now regularly “camp out” for Amiibos on release day so I can be sure and get them and have found that I generally enjoy the hunt. It still feels immensely satisfying to get an Amiibo that could be rare or hard to get. Of course, there is the value of Amiibos which is appealing too. It is awesome to know that I have an original Villager that was going for $100 a few months ago. I’ve also grown to appreciate the details on Amiibos and seeing them improve in quality over time. Whenever I go to buy Amiibos, I like to be able to search through the Amiibos they have and find one with a good paint job or face. There are many skeptics of Amiibos who think the quality of the figures is too low or that Nintendo should have every Amiibo on the store shelves for them to easily get. I understand these criticisms, but I have thoroughly enjoyed collecting Amiibos and have all but two of the rarer ones now. If you put in the effort and energy (or are willing to shell out for Ebay prices), it is very doable to collect them all. Amiibo collecting has gotten me into figure collecting (and creating this website) and I suspect there are many other people who have started buying other figures too. While I haven’t opened almost any of my Amiibos (this may be the subject of another article later on), I do look forward to using them as I get caught up on Amiibo compatible games and I can’t wait to create an awesome display one day for my collection. The future of Amiibos looks bright with Smash Bros. ending soon and new series like Animal Crossing and Chibi-Robo coming later this year. Next Jakks Pacific World of Nintendo Micro Land is Coming!